We firmly believe that the advantage of being aware of the past enables us to be more responsible and therefore morally obliges us to take a stand against these inhuman practices. The music in this programme represents the true living history of that long and painful past. Let us listen to the emotion and hope expressed in these songs of survival and resistance, this music of the memory of a long history of unmitigated suffering, in which music became a mainspring of survival and, fortunately for us all, has survived as an eternal refuge of peace, consolation and hope. Humanity is divided into two: masters and slaves. Despite the fact that for more than four centuries, from 1444 (the year of the first mass slaving expedition, described in a text from the period) to 1888 (the year slavery was abolished in Brazil), over 25 million Africans were shipped by European countries to be bound in slavery, this period of history – one of the most painful and shameful in the history of mankind – is still largely unknown by the general public. The women, men and children who were brutally deported from their villages in Africa to the European colonies in the New World had only their culture of origin to accompany them on the journey: religious beliefs, traditional medicine, dietary customs, and music – songs and dances that they kept alive in their new destinations, known as habitations or plantations. We shall try to evoke those shameful moments in the history of humanity through a series of eloquent texts and accounts, accompanied by the emotion and vitality of the music to which the slaves sang and danced. And yet, how could they think of singing and dancing when they were reduced to the condition of slaves? The answer is simple: song and dance, rhythmically structured by music, were the only context in which they could feel free and express themselves – something that nobody could take away from them. Singing was, therefore, their chief means of expressing their sorrows and their joys, their suffering and their hopes, as well as a reminder of their origins and their loved ones. It enabled all those people with their diverse origins and languages to create a common world and withstand the negation of their humanity. In Antiquity and the Middle Ages, black slaves were a rare, exotic and very costly merchandise for their owners. For more than two thousand years, the majority of slaves were white, originating in Northern Europe and the regions around the Mediterranean Sea. All this changed when a sizeable commercial trade, instigated by the Crowns of Portugal and Spain from the middle to the late 15th century was established between Europe, Africa and America. Slavery already existed in Africa before the massive Portuguese and Spanish slaving expeditions began. It was the need to replace the feeble workforce of native Indians, especially when it was recognized that Indians had a soul and must be converted to Christianity, that the modern trade in black African slaves to the New World began. We know that there were black slaves on board the ships of Christopher Columbus, and also that in the years immediately after 1500, King Ferdinand I sent instructions for the purchase and transfer of black slaves to the island of Hispaniola, where they were sent to work in the gold mines. Alonso de Zuazo, appointed judge in residence on the island by Cardinal Cisneros, recommended in a letter dated 22nd January 1518: “Dar licencia general que se traigan negros, gente recia para el trabajo, al revés de los indios naturales, tan débiles que solo pueden servir en labores de poca resistencia.” (To issue a general authorisation to import Blacks, who are strong and can withstand hard work, unlike the native Indians, the latter being so weak that they are only useful for tasks that do not require much stamina.) It was on this same island that the first revolt of black slaves took place in the New World in 1522. The French began to trade in black African slaves in the 1530s at the mouths of the Senegal and Gambia Rivers. From the beginning of the 17th century, the English arrived in the Caribbean, first in the Bermudas (1609) and then in Barbados, while the Dutch were the first to unload twenty African slaves (20th August, 1619) in the port of Jamestown in the English colony of Virginia, which became the centre of the tobacco-growing industry. It was the first time that Blacks had set foot as slaves on the soil of the future United States. It was also the beginning of a particularly painful history: the history of today’s Afro-Americans. In this CD/DVD book from ALIAVOX, featuring the live audio and video recordings of the concert at the Festival of Fontfroide Abbey on 19th July, 2015, we aim to present the essential facts surrounding that terrible history, thanks to the extraordinary vitality and profound emotion of this music, preserved in the ancient traditions of the descendants of slaves. The music lives on, etched into the memory of the peoples concerned, from the coast of West Africa and Brazil (Jongos, Caboclinhos paraibanos, Ciranda, Maracatu and Samba), Mexico, the islands of the Caribbean, Colombia and Bolivia (songs and dances from the African traditions), together with the traditional Griotte music still found in Mali. The music is performed by musicians from Brazil, Colombia, Mexico, Mali, Morocco and Madagascar in dialogue with Hispanic musical forms inspired in the songs and dances of slaves, native Indians and racial mixes of all kinds based on African, Mestizo and Indian traditions. 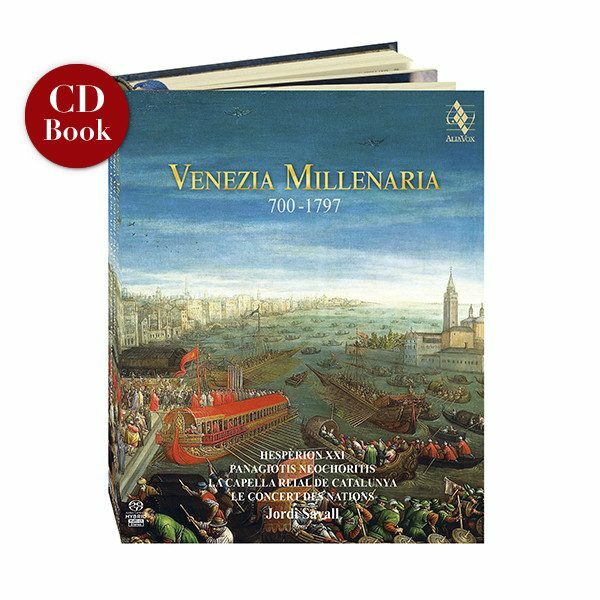 The contribution of the more or less forced collaboration of slaves in the Church liturgy of the New World is represented in this recording by the Villancicos de Negros, Indios, and Negrillas, Christian songs by Mateu Flecha the Elder (La Negrina), Juan Gutiérrez de Padilla (Puebla mss. ), Juan de Araujo, Roque Jacinto de Chavarria, Juan Garcia de Céspedes, Fr. 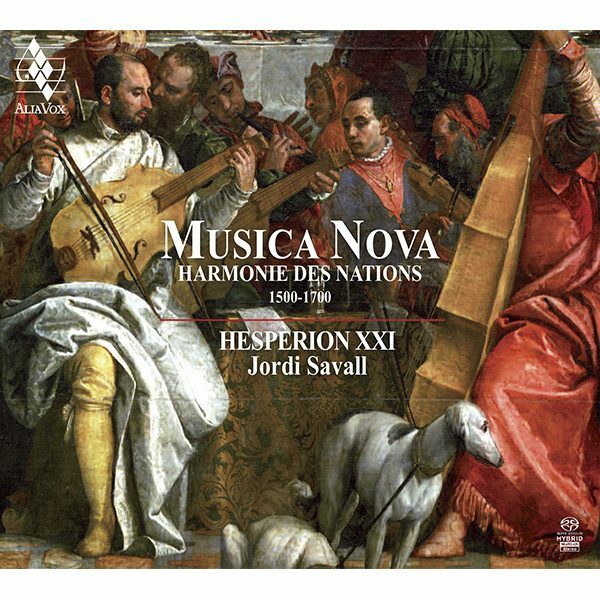 Filipe da Madre de Deus, etc., performed by the vocalists and soloists of La Capella Reial de Catalunya and Hespèrion XXI, together with musicians from Brazil, Venezuela, Argentina, Mexico, Spain and Catalonia. For the first time, they come together in a triangular relationship, linking the three continents of Europe, Africa and Latin America, and the heritage of Africa and America with borrowings from the European Renaissance and the Baroque, resulting in a disturbing and at the same time deeply hope-inspiring record of a musical heritage which is the positive reverse side of a culture of conquest and forced conversion. There could be no starker contrast than that which exists between the striking beauty and mysterious power of this music and the brutal accounts and detailed descriptions that our selection of chroniclers and religious of the period (texts recited by Bakary Sangaré) gave concerning the expeditions to capture men and women in their African villages. We are given an insight into those accounts through the studies, historical research and reflections on the subject contained in the excellent articles contributed by our formidable team of experts: Paul Cartledge, José Antonio Piqueras, José Antonio Martínez Torres, Gustau Nerin and Sergi Grau (timeline and selection of source texts). Through the music of the descendants of slaves, we also wish to pay a moving tribute as we remember that dark period, and appeal to each one of us to recognize the extreme inhumanity and the terrible suffering inflicted on all the victims of that heinous trade. It was an ignoble enterprise perpetrated by the majority of the great European nations against millions of African men, women and children, who for more than four hundred years were systematically deported and brutally exploited to cement the great wealth of 18th and 19th century Europe. Those civilized nations have not yet deemed it necessary to make an unreserved apology, or even to offer any kind of compensations (symbolic or real) for the forced labour carried out by the slaves who were regarded as chattels (nothing more than “tools” without a soul). On the contrary, the four-centuries-long slave trade, during which they became established on the coasts of Africa, paved the way for the principal European countries’ “colonisation” of Africa. In other words, it confirmed them in the belief that the continent was their property. It is as if from the end of the Middle Ages to the end of the 19th century, Europe had relentlessly pursued one common goal: to subjugate, one after the other, all the lands stretching south of the Mediterranean. In view of the extremely serious situation of large numbers of people risking their lives to reach Europe from Africa (so far, more than 3,000 have died since the beginning of 2016) by crossing the sea once known as the MARE NOSTRUM and now a sad MARE MORTIS, why is it that today, in the 21st century, none of the those responsible for immigration in European countries remembers our enormous moral and economic debt to the Africans who are now forced to flee their homelands, currently mired in abject poverty or ravaged by tribal or territorial wars, and frequently abandoned to corrupt dictators (propped up by our own governments) or insatiable multinational companies? We also want to draw attention to the fact that, at the beginning of the third millennium, this tragedy is still ongoing for more than 30 million human beings, of whom many are children or young girls subjected to new forms of slavery brought about by the demands of production and prostitution. We need to speak out in indignation and say that humanity is not doing what it should to put an end to slavery and other related forms of exploitation. Although absolutely illegal in the vast majority of countries in the world, and despite also being officially condemned by the international authorities, slavery still exists today, even in the supposedly democratic developed countries. Again, as Christian Delacampagne writes, “In the face of slavery, as in the face of racism, there is no possible compromise. There is no possible tolerance. There is only one response: zero tolerance.” Against the absolute outrage of the exploitation of child labour and the prostitution of minors, against these endemic ills in human society, which continue to breed new forms of slavery, and against that hatred of the other, which is the inhuman force of racism, the struggle is not over. Through the texts and music of our CD/DVD book, we hope to contribute to that struggle. We firmly believe that the advantage of being aware of the past enables us to be more responsible and therefore morally obliges us to take a stand against these inhuman practices. The music in this programme represents the true living history of that long and painful past. Let us listen to the emotion and hope expressed in these songs of survival and resistance, this music of the memory of a long history of unmitigated suffering, in which music became a mainspring of survival and, fortunately for us all, has survived as an eternal refuge of peace, consolation and hope.